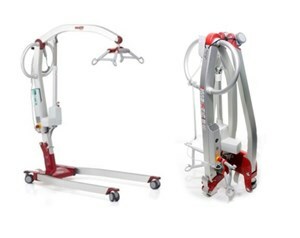 Awarded for Design Excellence in Europe, the Molift Smart 150 is a lightweight, portable patient lifter designed to be easily wheeled and transported. It is ideally suited for use in home care, for travelling, transporting in a car or to be easily stored. With a lifting range of 27 – 168 cm (10.6″ – 66.1″) the Smart 150 provides an excellent maximum lifting height and at the same time gets low enough to facilitate lifting from the floor. The 4-point sling suspension is standard and guarantees the patient hoist gives a comfortable lifting position for the user with ample space around the head area thereby eliminating any risk of the head bumping into the suspension or the user swinging side to side. With the combination of sling and suspension, the user will slide into a natural, correct seating position, from lying to sitting and vice versa. The Smart 150 has a unique design with an excellent centre of balance and together with the small footprint makes it easy to manoeuvre even in tight spaces. The unit includes a Molift Battery and Molift Battery Charger. Available also is the Molift Smart Soft Travel case. It is ideal for use when travelling, transporting or storing the Smart 150. For aeroplane travel and other situations when bulk stowage is required, the Molift Smart Hard Travel Case is a suitable option. Both cases are sold separately.